Below you will find our write-ups that we shared yesterday at our presentation about residential schools (click the image to enlarge it). I Am Not a Number, When I Was Eight, and When We Were Alone are some of the books we studied to learn more. As part of our learning in English Language Arts, French, and Social Studies, we have been learning about Treaties and Residential Schools. There have been many parts to this study. This year, the St. James-Assiniboia School Division has placed a Treaty One land declaration in every school, acknowledging that our schools are on the traditional territory of the Anishinaabe, Ininiw, and Dakota, and the homeland of the Métis Nation. Mrs. Waters, one of our division’s Indigenous Education Teachers, has visited our school throughout the year to teach us what treaties are and how we are all treaty people. Recently, she taught us the Indigenous origins of the words Winnipeg, Manitoba, and Canada and how Treaty One was quite unfair to the Indigenous signatories. In addition, we have been exploring residential schools through the Project of Heart. 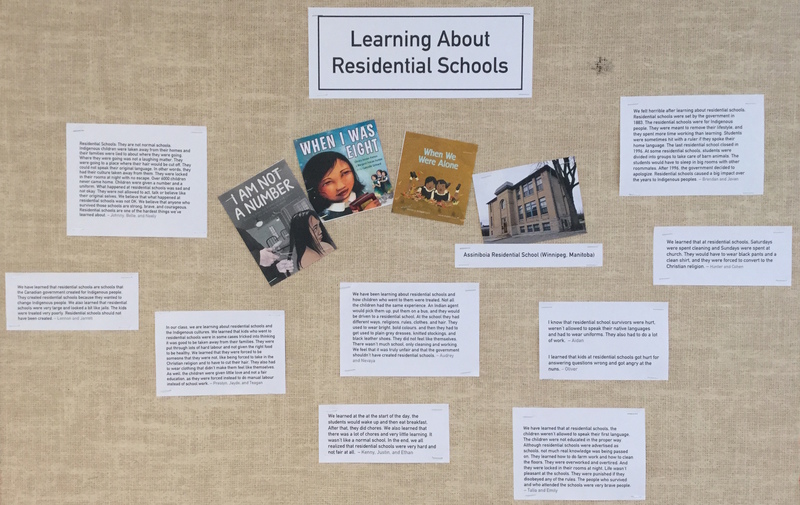 We read a variety of children’s books, and we also learned that there was a residential school located in Winnipeg on Academy Road. We were surprised to learn that the Assiniboia Residential School operated so close to our community, from 1958 to 1973. This morning, we visited the Ma Mawi Wi Chi Itata Centre to share with residential school survivors what we have been learning. In small groups, students read a short summary of their learning, which they then read to the survivors and their family members. As a class, we have also discussed the notion of reconciliation, or how Canada can move forward and heal. Our gestures of reconciliation, which we drew onto small wooden tiles, were presented to our audience on Monday. They will be sent to the National Centre for Truth and Reconciliation and will be shared with other residential school survivors from across Canada. Students have acknowledged that this learning has been difficult. Residential schools are indeed a difficult and tragic part of Canada’s history, and their legacy is still felt by many. In keeping with the national Truth and Reconciliation Commission’s Calls to Action, our class can be proud to say that we are moving towards reconciliation by learning and reflecting on our new, collective knowledge. I am extremely proud of the work 6F5 has done. Bravo! Changing between improper fractions and mixed numbers – changer une fraction impropre en nombre fractionnaire. Click here to create some practice questions to work on at home. We will continue to practice fraction concepts for the rest of the year, even as we begin to explore other math topics. Fractions are often tricky, so this is why we’re making them part of our regular math routine! All students at Ness will be attending Festival du Voyageur on Tuesday, February 21 for the whole day (9 AM – 2:55 PM). We have a fun day of activities lined up at Voyageur Park. Permission forms and an information letter were sent home yesterday; please return them as soon as possible! Great news, too: This year, the Festival du Voyageur field trip will be free for all students! Thank you to our incredible Parent Council and administrative team for covering the costs! It’s time for the annual Expo-Sciences! Information will be sent home via the division’s email/callback system about the annual Science Fair, and I’ve included a copy of this information below. Participation in science fair is optional, and projects must be done in French.